Lauren Colburn earned a STARS Fellowship to work this summer in Yale Professor Jessica A. Cardin’s neuroscience laboratory. 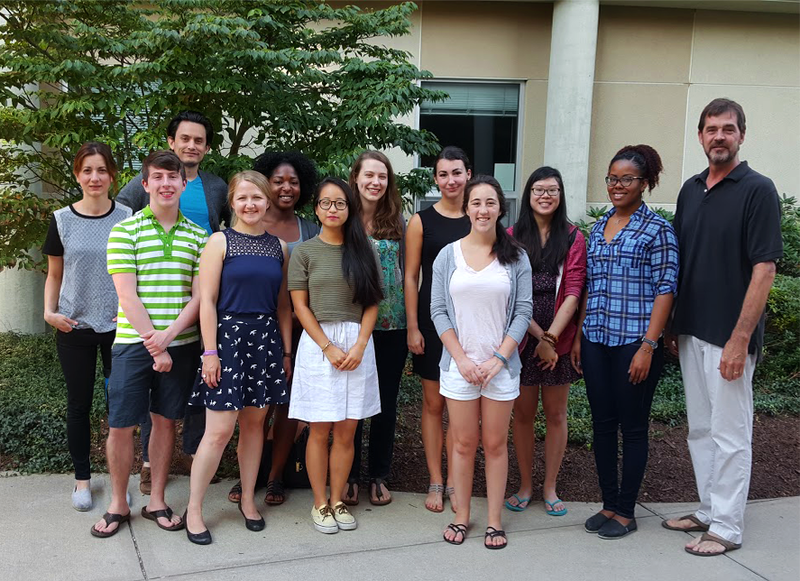 Ben White was awarded a UConn IDEA grant to support his summer studies with SHARP. Alyssa Zabin received a UConn IDEA grant, a summer internship at Liberty Mutual Insurance, and her honor’s thesis project was profiled on the departmental website. Four SHARP members had presentations accepted for national conferences: Natasza Marrouch, Mary Brisca, Megan Iacocca, and Blair Johnson. Blair Johnson was promoted to Board of Trustees Distinguished Professor of Psychology (there will be a formal ceremony in the Fall, 2015, semester). Three SHARP members graduated with their bachelor’s degrees: Megan Iacocca, Rabale Hasan, and Neera Ramchandani. Rabale Hasan and Megan Iacocca completed their honor’s theses. UConn’s social psychology program has admitted Megan Iacocca for her graduate work. To be published soon in Psychology & Health, this article addresses the use of studies’ methodological quality in meta-analysis. Co-authors include Rob Low and Hayley MacDonald. New National Institute of Aging (NIH) grant support to focus on the Science of Behavior Change (through a sub-contract with the Resource Coordinating Center, based at Columbia University, New York, NY). New funding from CLAS’s Bennett Fund to focus on interpersonal violence. New funding from InCHIP and UConn-Health’s Department of Psychiatry to focus on placebo responding in antidepressant trials. 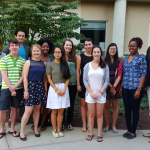 Two members of the team received undergraduate grants: Michaela Mato and Taylor Mangini; two completed undergraduate grants and presented their work at UConn poster sessions: Stephanie Lin and Benjamin White. Two graduate students received prestigious Farber Awards to support their graduate training: Natasza Marrouch and Kiran McCloskey. Rebecca Acabchuk, Emily Hennessy, Natasza Marrouch each published articles this year, many in collaboration with SHARP lab leader Blair Johnson. There are many new members on the SHARP team in the last 12 to 15 months (see our names and photos here). Finally, congratulations Benjamin White, Stephanie Lin, Allison Fusaro, and Rachel Takes, who each graduated in the May 2017 commencement. We’ll miss you! The team composed of Dr. Andrew Winokur (UConn Health), Dr. Irving Kirsch, as well as SHARP members Rebecca Acabchuk and Blair T. Johnson has been awarded a grant from a University of Connecticut competition hosted by the Institute for Collaboration on Health, Intervention, and Policy (InCHIP) and UConn Health (Psychiatry). Their project will focus on placebo responding in antidepressant trials. Congratulations, SHARP! Hayley Vanessa MacDonald has accepted a tenure-track assistant professorship at the University of Alabama. Congratulations, Hayley, we’re proud of you and wish you all the best! Rebecca Acabchuk successfully defended her doctoral dissertation in UConn’s Department of Physiology and Neurobiology. Congratulations, Becky! Congratulations to the three most recent SHARP alumni! Three completed bachelor’s degrees, including (a) Alyssa Zabin, who finished her Bachelor’s as a University Scholar with a double major in Psychology and Sociology; (b) Angela Suh, Psychology Major, Neuroscience Minor, Physiology and Neurobiology Minor, Molecular and Cell Biology Minor; and (c) Tashmia Bryant, with a Psychology Major. Last but not least, Robert E. Low completed his Ph.D. in social psychology. We wish you the best! Keep SHARP! Congratulations to Alyssa Zabin, Student Welcome Speaker, 2016 UCONN Scholars Day Ceremony! Congratulations to SHARP member and University Scholar Alyssa Zabin, who was Student Welcome Speaker at UCONN’s Scholars Day Ceremony March 24, 2016! She spoke to the near-capacity audience at Jorgensen Auditorium. Thanks for the shout-out during your speech, Alyssa! Natasza Marrouch has been named an IBACS Fellow for Summer, 2016. Dr. Pamela Rackow will be joining the Health Psychology group of Prof. Marijn de Bruin at the University of Aberdeen in May 2016 as Research Fellow. The University Scholar Program is one of the most prestigious programs for undergraduates at the University of Connecticut. Available to students from all of the University’s schools and colleges, the University Scholar Program allows students to design and pursue an in-depth research project and to craft an individualized plan of study that supports their intellectual interests during their final three semesters. Graduating as a University Scholar is considered the highest academic achievement that UConn bestows on undergraduate students. No more than 30 University Scholars are selected each year. You can see all the 2016 University Scholars here. Ben and Steph join Alyssa Zabin (class of 2016) as three current SHARP members with this honor. Congratulations are due to Hayley MacDonald, who successfully defended her doctoral dissertation on August 10, 2015; her co-major professors were Profs. Linda S. Pescatello (Kinesiology) and Blair T. Johnson. Great work, Dr. MacDonald! The Reid et al. (2014) study focused on how prejudice against African Americans can compromise health promotion efforts has been profiled on the ANES website. You can see the details here.